I love lunch hours during work. Who doesn’t? It’s possibly the best time to excuse ourselves from whatever work commitment and tasks we have. Just eat, chill and relax right – albeit for only an hour or so. But here’s the thing that I dislike about having lunch, especially with colleagues. Well, sometimes, just sometimes, lunch with colleagues (particularly in a big group) has a few tiny problems of its own. 1) Colleagues order as though they’ve not eaten for ages. You order a reasonable priced food sufficient for yourself. But, the grand total is equally divided. 2) Everyone order a standardized set meal. Some colleagues order side dishes, meant to be “shared” but they end up walloping all. For example, a plate of fried squid but you took only 1 or 2 pieces. But still, you have to pay the share because it’s “shared”. Like this also share equally? Flied You! 3) A colleague offers to pay first. Your meal costs RM8 and you gave RM10. 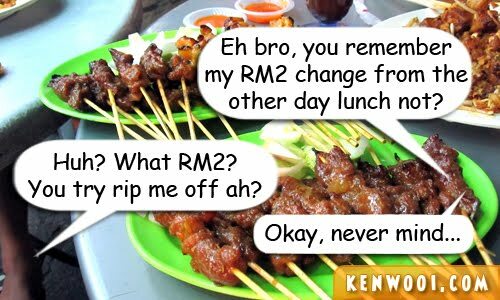 But since he didn’t have the change, he says “next time” – but after weeks and months, the RM2 change never seem to return. If you remind him about the petty RM2, it would make you look damn calculative. What a Flier! Like this also can forget. 4) You offer to pay first. Your colleague’s meal costs RM11 but he gave you RM10 – saying that he’ll pay the remaining RM1 later. But as expected, it never happened. 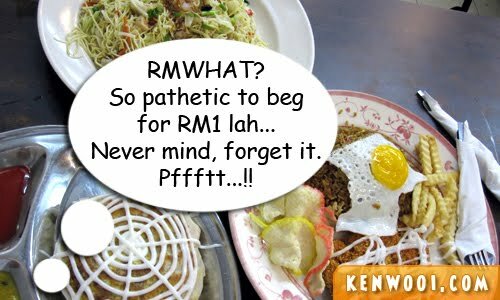 It’s so pathetic if you “request” for that RM1. So you gave up. 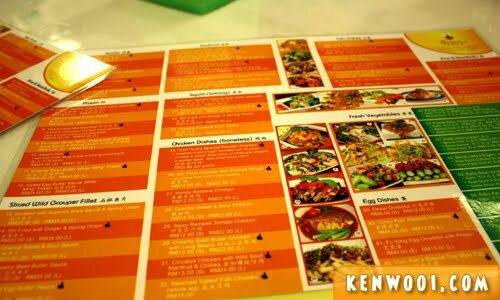 5) Boss brings you and your colleagues out for lunch. He orders like a king and encourages all to order too – seems like he’s gonna settle the bill. But after paying first, he tells everyone to pay up in the end. Yay! BEST. BOSS. EVER! Teaches us financial planning during meals. Oh well, I personally think that this is unacceptable. It may be a petty issue for many, but that’s not the case for some. 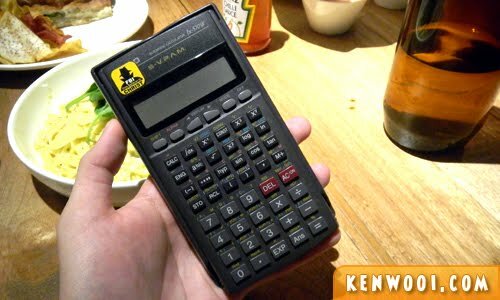 You know what, the next time I have lunch with colleagues, the calculator will come along. Yes, you betcha! At least I can pass it around for calculation, or if not – I calculate for them on the spot and show them the exact amount. Can calculate with all the sophisticated sin, cos and tangent for accuracy. Eh, every dollar and cent count weh. So if you’re my colleague one day, you better watch out while we’re having lunch together. I don’t earn to chip in for your meals alright. Don’t play play. 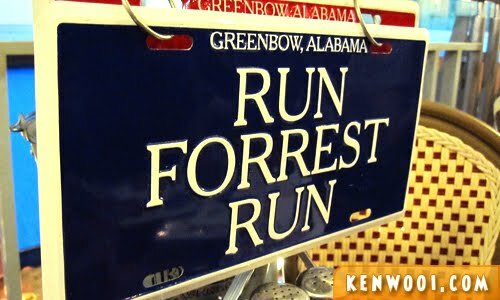 If you play play, you better run to the forest… away from me. Uhh, wait… I’m not sure what does that mean though. Anyway, point delivered. Kthxbai! Disclaimer: Conversations are for illustration purpose only. doom.. exactly right.. especially the I don’t remember you have any change in me.. ha ha ha..
haha nice one bro. i know that feel. these days i also dont care d.
Nothing like having lunch with me, right? Hehehehehe!!! Once in w awhile is okay la but is always like that die lor. 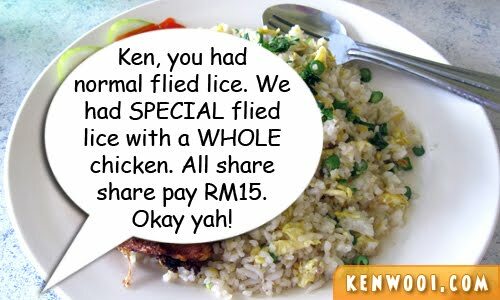 Adam is right, next time just pay your portion hahaha. this reminds me of my uni friends. after makan together, all whip out the calculator or handphone and count how much they ate. and in the end they calculate down to the cent and pay you the exact amount to the cent~! different crowd is different. but i always remember uni friends always ready with …. 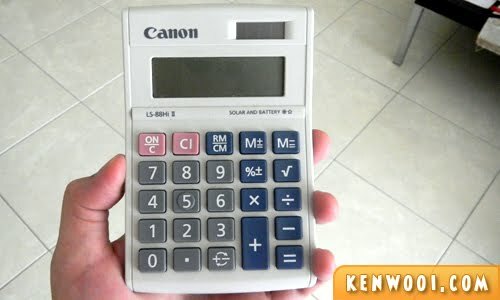 u guessed it scientific calculator to count the bill~! and then they would write down who owes how much. seriously~! wow! i didnt know there’s boss who wont treat at the end! pathetic! Hey Ken, purposely wrote this up to let them read? hahahaa… good one here.. when it comes to lunch in my office, the most is 2 or 3 persons.. not a big gang cos few chinese only ma.. we normally go AA…pay our own meal unless one is feeling generous and wanted to belanja all..
Having to end up chipping in for other people’s meals is no fun at all. Yes better bring that calculator along next time. I count myself lucky that my friends and colleagues are not like that, we usually divide the amount according to what we individually ordered – the fair thing to do. u know i used to have a calculator in my handbag everyday. it’s very useful. until my friend lose it. sigh. u should bring it wherever u go. serious. u need to tell urself not to be taken advantage again and again. if u think the way they did the calculation is wrong, then u should just tell them off. and u pay for ur own meal. perhaps they may exclude u in future lunch, but then u will be able to have more opportunities to have lunch with other people? Common stuff like this happens a lot! Hence why I eat alone. …and that would be the reason I’m not asking you for lunch these days. Eh… not that I mind paying, I believe paying for my own meal, and I would not expect you to pay for it. What I’m trying to say is that, right now, I’m so dirt poor I can only afford a roti canai and ais kosong. Sometimes I just resort to biscuits at the office. hehe. So, unless you miraculously feel like buying for me, you won’t see me around for awhile. And on the boss note. That happened to me too! He sounded like he wanted to belanja us, and suddenly, we have to fork out money ourselves (and the worst thing, I’m running on low tank that time too!). I learned since then, never to expect my bosses to pay, ever! If they do, then that would be a bonus.